When we moved up to Reading, we made an effort to look around for appealing local restaurants. 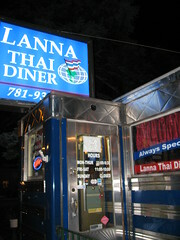 I can't say we've been that successful, but we did find one unambiguous hit: Lanna Thai Diner in Woburn. 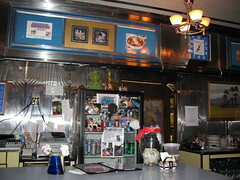 This restaurant is an old 50's style diner; all chrome and vinyl, outside and in, but turned into a Thai restaurant. The owner, Max, is friendly and fun. The resulting ambiance is outstanding. Those things alone would make it worth visiting once, but what has made it our regular "date night", when we have grandparents around to do babysitting is the food. Everything we've had there is very good, from a variety of curries to the Pad Thai, but the Karie Curry special is the one that we always make sure at least one of us gets. It's spicy, but not overwhelmingly so. It has a sweet, almost cinnamon-like flavor to it that is just amazing. The portions are generous but not overwhelming and everything has been delicious, including the appetizers (though the satay was sort of unremarkable). Additionally, while they always seem to have customers, and they clearly do a decent take-out business, we've never had trouble getting a table, despite being a quite small restaurant. Service is really quick, but I've never felt rushed.